Four weeks ago Interpret Europe started off their excellent conference on sensitive interpretation with a 12-hour trip to a place in southern Poland called Auschwitz. I don’t have to write much more than that to communicate that this was not a light-hearted, forgettable, or easily defined experience. 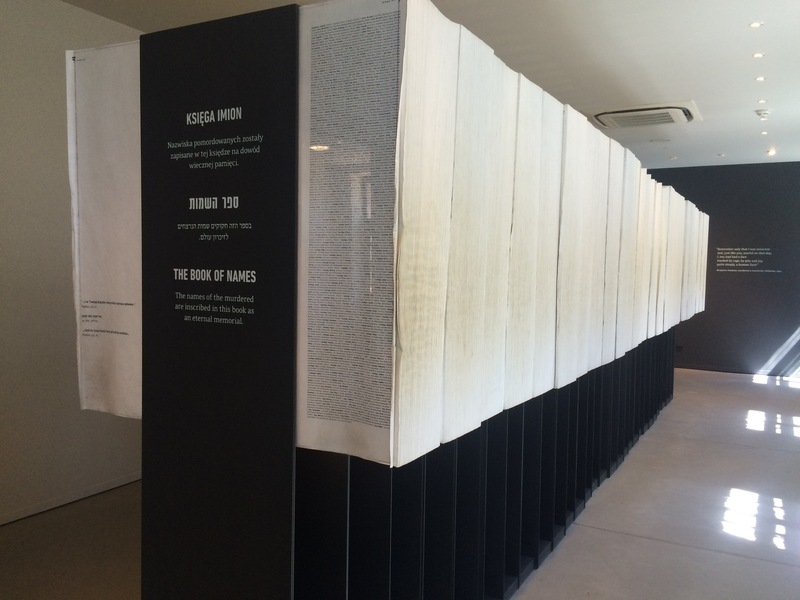 Interpreters tend to have extremely well developed imaginations, and just the word “Auschwitz” is enough to evoke images and feelings difficult to handle even thousands of miles away from the site itself. This is going to be something I’ll be processing for the rest of my life, but there is one aspect of the visit that wants to be discussed now, whether or not I’m ready for it. I think interpretation very often can get confused with telling people what they’re supposed to be feeling or learning. This isn’t surprising considering how often it involves influencing how people feel or what they know. That argument – whether interpretation is a form of manipulation or propaganda – isn’t something I’m going to get into right now, but to say that Auschwitz is beyond interpretation seems to follow that belief: that to interpret is to attempt to assert control and impose a definitive meaning over someone else’s experience. For me, interpretation at its best is a set of skills and tools used to help people find their own meaning and relevance to a site, a moment in time, a cultural or scientific concept, etc. When it was missing, we sought it almost desperately. There was one moment, hours into our tour, that we watched a short video of a survivor describe her experiences in the camp. After the minute was up, our guide attempted to get us to continue on to the next room. Nobody moved. Another story came on. In the middle of this machine, we had these stories to hold on to, this face, these people to help us see how to find the humanity here. “Slowly the guide bent down and scooped up a handful of nondescript soil. “ Do you know what this is?” he inquired. No one spoke. “It is Utopia. It is the bone remains of over 180,000 people.” There was a distinct intake of breath from the tour group. Slowly he let the handful of material sift through his hand and fall to the ground. “It is the bone remains of thousands of people and as I watch it fall I can not tell you if it is the bones of a German, a Austrian, a Pole, a Hungarian, a Romani, a Protestant, a Catholic, an agnostic, or a Jew. I can not tell you if it is a male, female, old man, mother, or a young child. I can not tell you if it is a political prisoner, or an undesirable, or just someone who was caught up in the wrong place at the wrong time. They are all as one, blended together as one people, one entity, one soul. It is Utopia. As a boy when I was between the ages of fifteen and sixteen it was my job to grind up the bone remains from the crematorium and bring them here.” At this point he raised his sleeve and displayed the tattooed number on his arm. It’s a strange thing. I spent hours and days thinking about this trip, talking about it, looking at the photos, trying to figure out how to get into the blocked off part of me that held this experience. It’s never going to come clear in one solid piece, and it shouldn’t. But that simple moment of second-hand interpretation gave me a perspective, an instance of clarity, that shifted everything inside just enough for me to find a way in and share this with you. That’s something worth believing in. Right now, at the South Carolina Aquarium, it is definitely intern-palooza! Every summer, we have a group of interns that take over the Aquarium floor with vibrant energy and youthful smiles. I manage a group of ten high school students and it is my favorite time of the year! This generation of millennials are so important and vital to our future. We are instilling values in them that will shape their future and impact their decisions for the rest of their lives.. how powerful. Our High School Internship Program is one of the most competitive and rigorous programs around, which I am proud to be a small part of. We usually receive over 100 applicants, interview 50, accept 20 into the 5 months of training classes, and then accept 10 of those to participate in a paid internship during the summer. We truly have the best of the best by the summertime. Millennials are the next generation of people that have a real possibility of making positive changes in our world. It is refreshing and hopeful to see such passionate young adults, eager to learn and to educate all of our guests at the South Carolina Aquarium. It is vital, as their supervisor, that I instill the power of education in them and just how much of a difference they can make. During their internship, the students are members of the Education Department. Their job is to help guests make connections with the animals and habitats of South Carolina in a way that they will remember… a.k.a. “interpretation.” They bring out animals for the guests to touch and get an up close look at, they bring out artifacts that the guests can hold in their hands and feel, they help guests touch marine animals in the touch tank, and help guests come “fingers to fins” with sharks in our new Shark Shallows exhibit. Two weeks into the program, they are already creating a positive experience for our guests with their presence on the floor. What they probably don’t realize yet is the impact that they are making from every moment they are interpreting with guests. After I read that, I thought to myself.. “He gets it.” Although they are just high school students, they are beginning to understand the power of interpretation and how it can impact visitors’ in lasting ways. I am so proud to be able to teach these young minds their importance and the positive ways that they can change the world. =) What a rewarding summer this will be. Every place has its story, its history. I enjoy knowing, though often can just imagine, what a place looked like in the past and what may have happened there. Place names often tell us. Sometimes they tell us what we’ve lost, such as a scene I long enjoyed while driving to town. A lovely, little stone house stood amid a tidy yard at the end of a long driveway flanked by wildflower fields. Now the house is gone, replaced by half a dozen new homes, the driveway now named “Stone House Road.” I expect everyone sees subdivisions or shopping centers named for what used to be there. Visitors often ask this question. My answer is sometimes simple. According to a historian, “pink” is a general Anglo-Saxon word for flowers, and the valley was settled by folks of this ancestry. I don’t always stop there though, because the answer is really more complicated. 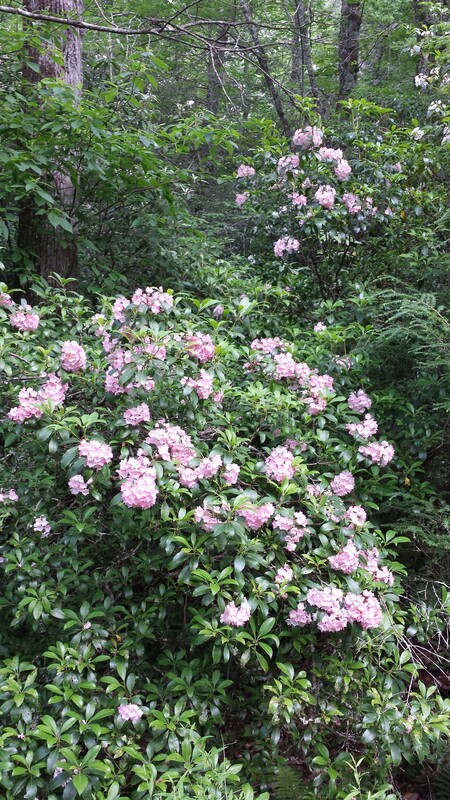 In their memoirs Vanderbilt’s two foresters wrote the name came from the abundant mountain laurel and rhododendron blooms. They likely learned this from locals in the 1890s, but maybe they both deduced that by observing the landscape. They must have not been aware of an earlier writing that credits a wildflower, downy phlox, said to have bloomed in such profusion people ventured from surrounding towns to enjoy their beauty during an era when travel was challenging. An expert on Southern Appalachian ecology and flora trusts the phlox story. He would even argue against the mountain laurel and rhododendron- “they don’t grow in beds….” Since I respect him greatly, I trust the phlox story, too, even though today I see only patches along roadsides since the forest has long reclaimed the farms. These past few weeks though I believe the foresters’ accounts. The mountain laurel blooms have been so abundant, so full, so unbelievably beautiful that I can see how they could have inspired the name “Pink Beds.” I have been walking around in awe, snapping photo after photo, not being able to get enough of a flowery phenomenon I have never experienced, and neither have locals living here longer than my 25 plus years. So flowers it is, despite a geologist who told me “Pink Beds” comes from the rosy quartz found here (I haven’t seen it here) and the hydrologist who claimed the name is actually from the numerous bogs the settlers called “sinks” where a rare lily, the swamp pink, blooms. Ahh…another flower. No, no—not that kind! Now that I have your attention, let me introduce to you this beautiful plant. It grows 3-4 feet tall with clusters of tiny white flowers grouped in umbels. (What a fun word to say aloud! – I bet you just did too, didn’t you?) This tall plant grows in arid poor soil and is famous for growing in ditches, along roadsides and in pastures. As a child, I remember my Mom picking the flowers and bringing them in the house to show us how they magically changed color when she put them in water and placed them on the table. It always amazed me how this worked. Eventually she let us in on her secret of adding food coloring to the water and then she would let us pick our own and dye them whatever color we wanted. This simple act of picking a wild flower and adding it to the kitchen table was one of the first “science experiments” that captivated me. It made me want to try “dying” other flowers and through trial and error figure out that this weed was certainly special. My Mom was a genius! She let us discover the magic of the umbels turning colors and smell the sweet leaves and roots when they were crushed, but I must say that the fascination with that plant never really ended. Every time I see the umbels swaying in the wind, it brings back sweet childhood memories. How often do kids these days have these simple experiences, experiences that might open a child’s eyes to science, botany, insect behavior and ecosystems? How often do we overlook the very minute part of science to get to the “BIG PICTURE”? We didn’t have a lot of money growing up, but we were rich because we were surrounded by nature. We were allowed to explore and play in our backyards and parks. We were casually shown different plants to eat or avoid and we all sure knew the rhyme, leaves of three—let it be. But wait —there’s more! This plant has been around for ages, it is native to temperate regions of Europe and Southwest Asia. It has many uses especially to help with ailments of the bladder and kidney. Romans ate the root as a vegetable. It is only second to beets in the amount of sugar it contains in the root vegetable group. It was used as a sweetener by Irish, Hindus and Jewish cultures in puddings and other foods. In North America this was boiled into wines and used to sweeten coffee. Some added the dried seeds to foods to help prevent flatulence. (Boy I know some people that could sure use a dose of that!) The dried seeds were also eaten as a form of contraceptive. Boiled root made a wonderful tea, new leaves can be added to salad and flower heads were picked battered and fried. Flower heads picked and steeped in water not only made a tea, but add a little lemon juice, sugar and pectin and you have yourself a nice jelly. If I told you it is also known as Bishop’s lace, bird’s nest and wild carrot, you might know this plant right off. Some might know it better by its Latin name Daucus carota (yes, you just tried pronouncing this out loud too), and you might even have linked this back to the common name of the wild carrot. If you guessed Queen Anne’s lace, then you are right. As interpreters, let’s not forget to encourage our audiences to go back to the basics and become familiar with the plants growing all around them. Who knows, they might spark an interest into the field of science, botany and interdependence in nature. Their child might be so fascinated that they will continue research on a plant to find a cure for a strain of flu or one of the many diseases that are out there. Me, I will continue to photograph the insects that visit the umbels and stems while I harvest some of the umbels for my next batch of jelly. And if you have never picked Queen Anne’s lace and put it in dye, pamper yourself and spruce up you dining room with a little fragrance and color. The little flutter of joy it will bring to you, is priceless! Is your program a “full” experience? Two weeks ago my parents were in town visiting and we took them to a few places. We visited the Western North Carolina Nature Center, the Schiele Museum, and the Blue Ridge Parkway Visitor Center. My parents seemed excited just to spend time with their grand daughter that they only see a few times every year. When I suggested my father to go to his first NASCAR experience he seemed indifferent. He has never liked auto racing, in his mind there was nothing exciting about cars running in circles. I decided to take him to the race and let him experience it and leave if he seemed bored. The only information that seemed to relate to him is that a Mexican driver was racing on the number 18 car. When we arrived to the race track he was impressed with the size of the speedway. A 1.5 mile-long track does not seem as big on TV. When they gave the command “start your engines” and 40+ cars with 700 Horse power engines start up you can hear and feel it. My dad’s face went from this is kinda cool to “WOW”!. For the next two hours he did not say much other than pointing at the number 18 car, got really excited when he passed other cars and did not even take a “Maslow break”. When we got home he kept telling my mom about how big the place was, how loud it was and how skilled the drivers had to be to drive 160+mph and keep the cars under control as they bump each other. This is exactly what an experience where all your senses does to a participant. Whenever possible let your program participants listen, smell, taste, and touch as much as you can. The more you do so, the more memorable the experience will be. As for my dad, he already asked me about the next race in Charlotte.